On Wednesday, the national government officially made the package of measures it aims to dampen the economic crisis, mainly by rising inflation. The ads also try to reactivate low consumption. And they are known after the consumer price index (CPI) in March hit a peak of 4.7%. The first change was officially made the same Tuesday: the central bank announced that it will freeze the exchange band which sets the limits of the intervention. It is one of the great investments at Casa Rosada to stabilize prices. This Wednesday, the dollar began to fall. The scenario is very complicated for the government, especially for the election year. In three months, with 11.8 points, inflation already reaches half of the forecast for 2019. The annual data scares even more: 54.7%. ● "We think it was time to start by stabilizing the exchange rate issue give some relief to the Argentines, that so many efforts have been made in these difficult months for everyone. " ● "Therefore, after talking to the governors, we have agreed on the main references to Change and productive sector representatives, a series of actions aimed at: deepen the fight against inflation and help revive the economy. " ● "The most important measures we launch is an agreement with leading companies to maintain prices for 60 important products for at least six months and no provision for new course increases of public services for this year in the national government". ● "In addition, it is launched a new round of ANSES Credits, a new call for Procrear Plan and a new network of ANSES discounts for 18 million recipients. " ● "We are convinced that the deep and structural changes we have made over the years are indispensable for lowering inflation over the long term – and stopping this problem we have had for 75 years." 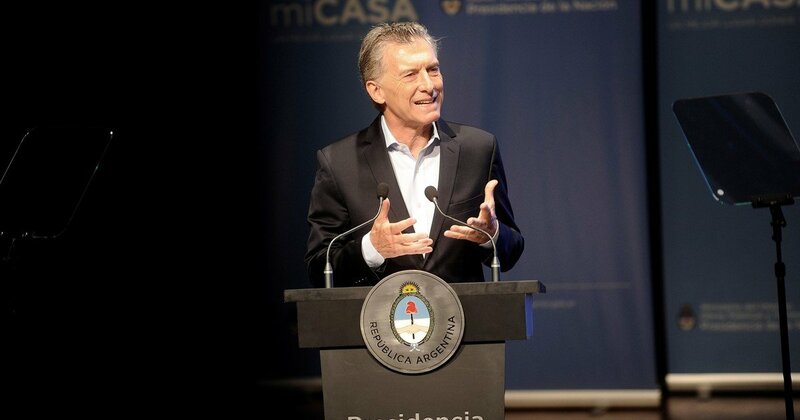 ● "In the short term, however, we are taking action to protect the Argentines at this transitional stage, so that together we can beat inflation, this reactivation continues to strengthen us on the way out of this major problem, which has been flogging us for many decades." ● "We reached an agreement with 16 leading companies so that 60 important products in baskets keep their prices for at least six months. ● Among these 60 products are oils, rice, flour, noodles, milk, yoghurt, yerba mate, tea, sugar, preserves, polenta, cakes, jams and beverages. ● Companies undertake to ensure the availability of products in the gondola in the 2,500 affiliated sales outlets across the country. They will be available from Monday, April 22nd. " ● "We launch ANSES Benefits, a network of discounts of between 10% and 25% for the 18 million people who receive ANSES benefits in supermarkets, clothing, lighting, travel and tourism, construction appliances, appliances and materials. ● Discounts reach: pensioners and pensioners, holders of non-contributory pensions (the majority due to disability), universal pension for the elderly, holders of Universal Child Allowance, holders of unemployment benefits, family allowances (employees) formal, Progresar Scholarships, household staff, We make the future, community productive projects and the program More lives in the province of Buenos Aires. ● Recipients get access to the discounts with their payment cards linked to ANSES. ● New round of ANSES Credits. In addition, we renew and extend the offer of ANSES credits with higher amounts and more fees. The ANSES credits are available to pensioners, non-contributory beneficiaries, universal child care and family allowances. In total, there are about 18 million people. " ● "By government decree, the government approves a new system of commercial loyalty, whose main purpose is to avoid abuse of a dominant position or any monopolistic behavior of large corporations. ● The Ministry of Internal Trade will now have more powers to sanction unfair or anti-competitive behavior. And protect consumers, small businesses and SMEs. " ● "The export coolers agreed to sell 120,000 kilos per week of rust, vacuum and matambre to 149 pesos per kilo (final price) at the Central Market Trade Fair and at the outlet of each refrigerator. ● To provide a reference, the Central Market sells about 70,000 kilos of meat per month. ● These cuts will be available when the new system is ready, within 10 or 15 days. " ● "The national government will no longer receive increased electricity, gas and public transport for families for the rest of the year. ● Residential electronics. There will be no new increases. The two increases announced for the rest of 2019 will be absorbed by the state. ● Gas. The increase applied since April and spread in three months (10% in April, 9% in May and 8% in June) is the last year. ● During the winter months, there is also a 22% discount on the gas price, which users pay on the summer invoices, those who have the lowest consumption. This makes it possible to "plan" the final invoice between winter and summer months. The cost of postponing these payments will be absorbed by the national state. ● Transport and tolls. There will be no increase in buses and large cities for the rest of the year. Nor will tolls be raised due to the national government. ● Important note These messages relate only to the electricity, gas and transport sections that depend on the national government ". ● "The operators agreed to keep mobile phone pricing for prepaid lines for five months until September 15, taking advantage of 35 million active lines." ● "The recipients of Universal Assignment for Child (AUH), We Make Future, Supplementary Productive Projects and the More Life program in the province of Buenos Aires and their family group have access to discounts of between 20% and 70% in drugs. In a network of 5,000 pharmacies distributed across the country have about five million recipients. " ● "We are expanding the credits for connection to the natural gas network to reach 70,000 homes that still use bottles today even though they live in the gas network." The gas network is safer, more comfortable and cheaper. ● The program enables connection to the natural gas network through low credit and up to 60 fixed installments from 489 pesos. The credit is paid together with the invoice and the households automatically receive the social gas interest rate for six months ". ● "We are going to open the call for a new call to the ProCreAr plan so that 10,000 new families can access their home and join the 30,000 they already wrote thanks to the ProCreAr plan. ● As in previous conversations, families will contribute a portion of the housing value (in this case 10% of the price) and the state 20%, with a non-refundable contribution. The average subsidy will be 550,000 pesos. ● On the other hand, we are ready to design alternatives to alleviate the situation of those who have mortgage loans in UVA today and experienced significant quota increases. ● "AFIP launches a new payment plan to settle tax liabilities paid by all taxpayers, with a lower tax rate than previous plans and a longer term to cancel them. ● Includes the liabilities for the main taxes (such as VAT, profits and personal assets) calculated on January 31, including payments and tax payments. ● The new plan can be regulated up to 60 parts (the previously achieved 48 installments). ● The highest interest rate for SMEs will be 2.5% per month, lower than in previous plans and well below market rates. ● Other taxpayers may also have a monthly rate of 2.5% if they make an initial payment of 20% of the debt. ● The first fee will expire on September 16 this year. Any plans that are desired can be presented, without borders ". ● "The period when merchants get money from credit card sales is shortened. Today, credit card companies pay every sale within 19 business days of the operation. The central bank, they will do so within a maximum of 10 business days. ● In addition, banks will not charge them more commission (today between 1% and 2%) to SMEs to receive money. This situation was not regulated by the BCRA, which will now set the regulation and ban the Commission. " ● "Export duties (refunds) are eliminated for all companies that export above the average of exports last year, the measure applies only to exporters of less than $ 50 million per year".